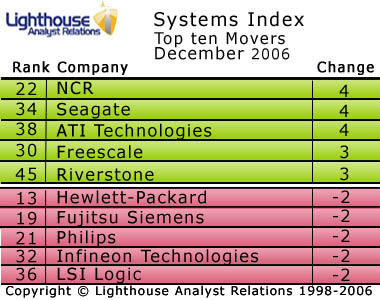 Dell has been edged out of its prized third place by Fujitsu in our December Services Index. AMD has moved up two places into sixth position. However, this is at the expense of both Sun Microsystems and NEC who have been downgraded to seventh and eighth spot respectively. Despite persistent rumours of job cuts at Dundee, NCR has had a good month in terms of its share of voice within the analyst community. It launched its Real POS 21 terminal in India and announced an agreement with SBI and 15 other leading banks in India for implementing image-based Cheque Truncation solution. Whilst teaming up with Ducati to create a super bike is great, we are not at all convinced that this has had a substantive affect on NCR rising four places and into the top 25 for the first time. Hewlett-Packard, Fujitsu Siemens and Philips all fell by two places. Symbol has fallen out of the top 25 altogether.